You guys are going to get sick and tired of me and my jam, but I can't help it. Each time the jars cooling on the counter pop, letting me know they're sealed tight for the long haul, my heart skips with joy. Soon there won't be enough toast to support all these jars, but that's why there are friends and holidays and random gifts. Steph over at Steph Chows is hosting a little jam exchange program. There are still a few days before I know who my exchange partner will be, but in anticipation, I couldn't help but look at all of last years traveling jam jars. While a lot of them looked yummy, one in particular stood out and I saved it to make "in the distant future". Well, welcome to the future. With peach season just starting, there are tons and tons of pretty peaches overflowing at fruit stands everywhere at extremely cheap prices. I got about 6 pounds for under $3, pulled up the recipe and got to work on Bean Town Baker's Vanilla Peach Bourbon Jam. Can I just tell you how much I love no sugar needed pectin? The first few jams I attempted were done without any commercial pectin, relying on the fruit and the sugar to set properly, and while it came out good, I was always worried that I'd end up with sauce instead of jam. And the one raspberry jam recipe that I tried to make without pectin came out good, but too sweet for me. This magical box gives me full control over the sweetness of the jam, all while more or less guaranteeing me the perfect set. How great is that? My peaches were on the firmer side, so mashing them with a potato masher was sort of out of the question, plus I wanted a smoother consistency anyways, so I mixed the fruit with the sugar and lime juice, pulled out what is becoming one of my favorite kitchen tools, my immersion blender, and whipped the suckers into a coarse pulpy consistency. Once the mixture started getting hot, I dumped in the vanilla and stirred stirred stirred like crazy, the rest as they say is history. And now I have a dozen beautiful jars of jam cooling on the counter and emitting loud pops every minute or so to let me know they're settled in to wait for winter. Note: I adjusted the proportions a little bit, so I ended up with a dozen 8oz jars and a bit smaller pectin to fruit ratio, but it still came out fantastic. Before you begin either wash jars in the dishwasher on the extra hot water cycle, or wash them with hot soapy water and boil them for 10 minutes, leaving them on dry or in the boiling water until you need them for your jam. This sterilizes the jar and lengthens the shelf life of your jam. I ran them through the dishwasher on the sterilize cycle. - The recipe suggests you blanch the peaches in boiling water for 30 seconds, submerge in an ice bath and then slip off the skins, but my peaches were prudes and that method didn't work, so I just used a peeler. Chop the peaches roughly into 1/4 inch dice, removing the pits. - Put the peaches, sugar, and lime juice into a large non-reactive pot and smash/blend the suckers into a rough pulp using either a potato masher or an immersion blender. - Put the pot over medium-high heat, add the vanilla pieces and bring the peach mixture to a rolling boil, stirring frequently to prevent scorching. Boil for 1 minute, then add the pectin. Bring the jam to a rolling boil once more, stirring constantly, and boil exactly 1 minute. - Remove the jam from heat. Stir in the bourbon and extract, ladle the hot jam into jars, and screw on the lids. Then set the jars on a rack in a large pot of boiling water--the water should be 1 inch above the jar tops. I just washed the pot I made the jam in (the only big pot I own), put the jars in, made sure they were under an inch of water and turned it on high. - Bring the water to a gentle boil and boil the jars for 10 minutes. Then remove the jars from the hot water and set aside to cool. You should hear the lids popping within a few minutes of their bath. - When the jam is cold, check the seals on the jars by pressing on the centers of the lids. If the lids do not spring back, they are vacuum sealed and the jam can be stored at room temperature. If the lid flexes, there is no seal, so store the jar in the fridge and enjoy it on a bagel in the morning. All of mine sealed, but I'm going to pretend one of them didn't and open it up tomorrow. The color of this jam is beautiful! I have never had jam with vanilla, sound really good. My Dad's peach tree is just starting to ripen, this will be perfect! Does the almond extract actually make it taste almondy or just create a full bodied flavor? Just curious! Thank you guys for your kind words and Sarah, since it's such a small amount, I think the almond extract just helped tie the bourbon to the peach and cut the vanilla a bit. I didn't really taste the almond flavor in the jam. You could probably leave it out if you want, but I liked it in there. This is absolutely gorgeous! Thank you for sharing. I absolutely adore home made jams and this looks really fantastic! Ah! I'm so excited to have you as my jam exchange partner!! Your jams look great :) And so do those brownies down below.. I just marked em for safe keeping! I thought I knew what I was going to do with the peaches I just got in the CSA (see the Cilantropist's post on peach salsa...) but now I'm torn. Maybe the only way to solve this is a trip to the grocery! This jam looks incredible!! congratz on the top 9! I gotta give this a try!!! Do you think you could substitute vanilla extract? Hopefully making this today! Exactly what I was looking for. Carrie, I'm sure vanilla extract will be fine, you might just want to add it at the end with the pectin instead of at the beginning. Let me know how it comes out! 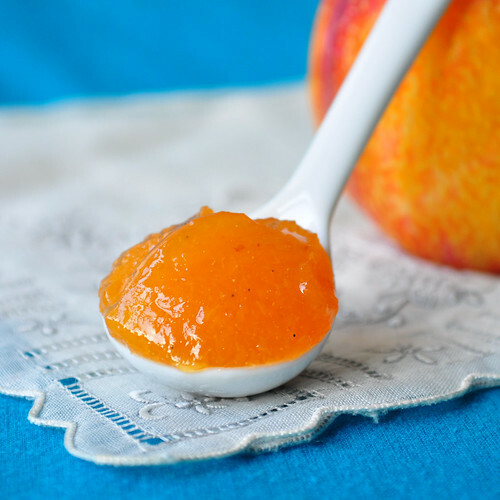 gorgeous color, and peaches with bourbon and almond extract sound amazing!!! I'm totally drooling over this!! Found this on Pinterest! It looks amazing and will try to make some this weekend. It will be my first attempt at jam! Thanks for sharing! I just wanted to let you know that I found your recipe on Pinterest last week and made it today! Thank you so much for sharing! I love peaches, love vanilla, and LOVE bourbon so this was an excellent recipe for me! I can't wait for morning to spread it all over some homemade bread. Anyway, the small tastes I got from the (cooled) pot were awesome. I have not been able to locate the prepackaged pectin so I have no idea what the amount to use is. I will have to look it up. The other thing: I got my peaches at a pick your own place and they do not weigh. By the time I double checked the recipe, I had already blanched, peeled, and destoned them. Now I am just going off of guesstimation. Do you think you could update this somehow with measurements that reflect cups of blended peaches and Teaspoons/Tablespoons of pectin to help out those of us that don't have the ability to weigh or find premeasured packets? When I blanche peaches, I drop them in boiling water for 2 minutes then a least a minute in the ice bath. It works well most of the time. My grocery store does not carry boxes of pectin. Rather, Ball seems to be marketing the product in jars now. The label on the jar says 3 tablespoons equals 1 box so that it the amount I used. However, jam is more of a sauce consistency. When I tore back the label on the jar it reveals that Ball recommends 1 1/2 tablespoons per 2 half pints. Did you mean to say 1 box of no sugar/low sugar pectin? I found no sugar pectin in my grocery store,in the baking isle... It says you use the whole packet... I will try again, and will be more diligent with measuring more carefully. Stacy Craig thank you for the comment that 3 Tbsp was not enough pectin. I followed the inner label instructions and put 9 Tbsp of pectin and it came out great! Sadly mine didn't set. It tastes great but I didn't want/need this much ice cream topping. 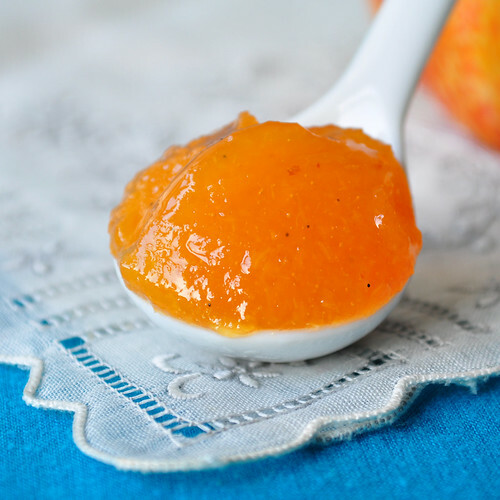 I love reducing sugar in jams especially with a really sweet peach jam. Can I do this without messing up the pectin? Thanks! My friend made this and gave me a jar; I know, lucky! It was so delicious! I am buying peaches tomorrow and making a batch as well. I just wanted to add that I served it with. Charcuterie tray; Olymipia Provisons just came out with a beef summer sausage, and a dollop of this jam on a slice of the sausage over a cracker? Spicy, sweet, salty, fruity, perfection! This looks so delicious! I am a little concerned because the original recipe from Bean Town Baker says to use 3.5 pounds of peaches (all other measurements are the same) but this one says six pounds. Maybe that explains why some people are getting more of a sauce? Just wanted to double check before I went to all the trouble of making it! I used white peaches and spice bourbon. To die for. I only have Certo Pectin (with sugar), how do I alter?! How many jars did this make.